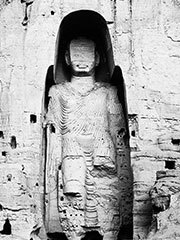 The Buddhas of Bamiyan were two monumental statues of standing Buddhas carved into the side of a cliff in the Bamiyan valley of central Afghanistan, situated 230 km (143 miles) northwest of Kabul at an altitude of 2500 meters (8,202.1 feet). Most likely built in the fifth or sixth centuries, the statues represented a classic blending of Greek and Buddhist art. The main bodies were hewn directly from the sandstone cliffs, but details were modelled in mud mixed with straw, coated with stucco. This coating, practically all of which was worn away long ago, was painted to enhance the expressions of the faces, hands and folds of the robes. The lower parts of the statues’ arms were constructed from the same mud-straw mix while supported on wooden armatures. It is believed that the upper parts of their faces were made from great wooden masks, or casts. The rows of holes that can be seen in photographs were spaces that held wooden pegs which served to stabilize the outer stucco. Bamiyan lies on the Silk Road, a caravan route linking China and India. It was the site of several Buddhist monasteries, and a thriving center for religion, philosophy, and Greco-Buddhist art. It was a Buddhist religious site from the second century up to the time of the Islamic invasion in the ninth century. Monks at the monasteries lived as hermits in small caves carved into the side of the Bamiyan cliffs. Many of these monks embellished their caves with religious statuary and elaborate, brightly-colored frescoes. The two most prominent statues were the giant, standing Buddhas, measuring 55 and 37 meters (180 and 121 feet) high respectively, the largest examples of standing Buddha carvings in the world. They were cultural landmarks for many years, the site being listed among UNESCO’s World Heritage Sites. Chinese Buddhist pilgrim Hsüan-tsang (Xuanzang) passed through the area around 630 AD and described Bamiyan as a flourishing Buddhist centre «with more than ten monasteries and more than a thousand monks», and he noted that both Buddha figures were «decorated with gold and fine jewels» (Wriggins, 1995). A monumental sitting Buddha similar in style to those at Bamiyan still exists in the Bingling Temple caves in China’s Gansu province. When Mahmud of Ghazni conquered Afghanistan in the 12th century, the Buddhas and frescoes were spared from destruction. Still, over the years Muslim iconoclasts hacked away at some of the statues’ details, mostly the facial features and hands. Aurangzeb, the last Mughal emperor, employed heavy artillery in an attempt to destroy the statues since orthodox Islam considers any form of idol to be the highest sin («shirk»). Afghan’s Islamist clerics would begin a campaign to crack down on «un-Islamic» segments of Afghan society. The Taliban soon banned all forms of imagery, music and sports, including television. There is reason to believe that this was in accordance with a strict interpretation of Islamic law . Information and Culture Minister Qadratullah Jamal told Associated Press of a decision by 400 religious clerics from across Afghanistan declaring the Buddhist statues against the tenets of Islam. «They came out with a consensus that the statues were unIslamic,» said Jamal. On March 6, the London Times quoted Mullah Mohammed Omar as stating, «Muslims should be proud of smashing idols. It has given praise to God that we have destroyed them.» He had clearly changed his position from being in favor of the statues to being against them. During a March 13 interview for Japan’s Mainichi Shimbun, Foreign Afghan Minister Wakil Ahmad Mutawakel stated that the destruction was anything but a retaliation against the international community for economic sanctions: «We are destroying the Buddha statues in accordance with Islamic law and it is purely a religious issue». The Islamist Taliban government decreed that the statues, which had survived intact for over 1,500 years, were idolatrous and unislamic. During the destruction, Taliban Information Minister Qudratullah Jamal lamented that, «this work of destruction is not as easy as people might think. You can’t knock down the statues by shelling as both are carved into a cliff; they are firmly attached to the mountain.» The two largest Buddhas faced dynamite and tank barrages and were demolished after almost a month of intensive bombardment. Though the figures of the two large Buddhas are almost completely destroyed, their outlines and some features are still recognizable within the recesses. It is also still possible for visitors to explore the monks’ caves and the passages which connect them. As part of the international effort to rebuild Afghanistan after the Taliban war, the Government of Japan has committed itself to rebuilding the two largest Buddhas. In May 2002, a mountainside sculpture of the Buddha was carved out of a mountain in Sri Lanka. It was designed to closely resemble one of the Buddhas of Bamiyan. In December 2004, Japanese researchers discovered that the wall paintings at Bamiyan were actually painted between the 5th and the 9th centuries, rather than the 6th to 8th centuries as previously believed. The discovery was made by analysing radioactive isotopes contained in straw fibers found beneath the paintings. Further discoveries are expected to be made after comparing the painting’s dates and styles. The Afghan government has commissioned Japanese artist Hiro Yamagata to recreate the Bamiyan Buddhas using fourteen laser systems to project the images of the Buddhas onto the cliff where they once stood. The laser systems will be solar-powered and wind-powered. The project, which will cost an estimated $9 million, is currently pending UNESCO approval. If approved, the project is estimated to be completed by 2007. In September 2005, Mawlawi Mohammed Islam Mohammadi, Taliban governor of Bamiyan province at the time of the destruction, was elected to the Afghan Parliament. Swiss filmmaker Christian Frei conceived a film, «The Giant Buddhas» (2005), that precisely talks about the destruction of the statues, the international reactions to it and all events surrounding this barbary. The feature is provoking, yet universal in its message against fanaticism, ignorance and intolerance, and thus implicitly recognising respect and protection of cultural sites as valid and necessary.
. Mainichi Shimbun, Japan, 2004-12-11.
. BBC News, 9 Aug 2005.